During the Spanish Civil War, foreign military officers wrote highly elaborate reports of their experiences at the front. One was attaché Col. Stephen O. Fuqua of the U.S. Army, who had once held the rank of major general. His presence was highly unusual, for most military observers were less-experienced captains, majors, and lieutenant colonels. Unfortunately, due to sales rights restrictions, we cannot offer Modern Warfare In Spain for sale in your country. 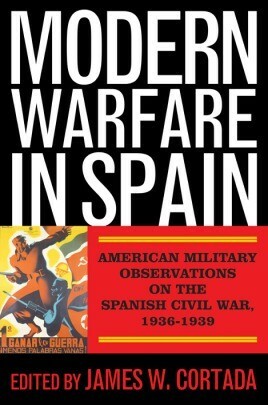 Fuqua’s reports contained important observations about Spanish armament and troop movements, and he managed to acquire Nationalist propaganda and information despite being situated entirely within Republican military lines. His reporting was considered so valuable that during World War II, Fuqua was tapped to be Time’s military commentator. Editor James W. Cortada brings Fuqua’s—and others’—insightful observations to light. The result is a volume of such immediacy that the reader feels transported to a time of great historical uncertainty amid the twentieth century’s great “dress rehearsal” for fascism and the conflagration of World War II.